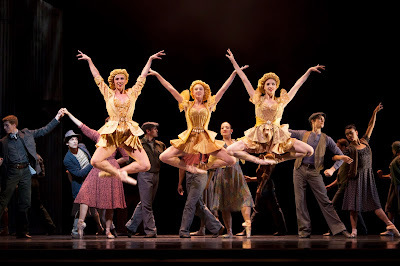 Pacific Northwest Ballet corps de ballet dancer Chelsea Adomaitis (far right) with company dancers in Concerto Barocco, choreography by George Balanchine © New York City Ballet. Photo © Angela Sterling. I've been thinking a lot lately about comings and goings, about transitions, and what inspires us to make changes in our lives. In part, that's a reflection of changes in my own career. You know how that can be; we see ourselves reflected in the world around us. For every person who decides to step away from something they're passionate about, a new and equally passionate person emerges. Over the past year I've spent quite a bit of time contemplating Pacific Northwest Ballet's corps de ballet members. My preoccupation was sparked watching the inimitable Francia Russell working with some of these young dancers in rehearsal for Concerto Barocco, by George Balanchine. PNB was headed to New York, and Russell was diligent in her preparations. Normally I watch the principals or soloists at work, but for this dance, the women in the corps were key. I was struck by the feathery lightness of Elizabeth Murphy's limbs. It seems that her arms and legs float on a zephyr. Pacific Northwest Ballet corps de ballet dancer Chelsea Adomaitis (right) with Elizabeth Murphy in Concerto Barocco, choreography by George Balanchine © New York City Ballet. Photo © Angela Sterling. I was also captivated by Leta Biasucci; the jaunty angle of her chin just dares the audience not to look at her. But it was in those Concerto Barocco rehearsals that I first really watched Chelsea Adomaitis. Tall, long-limbed and slim, Adomaitis fits into PNB's "tall girls" category, like a younger version of Laura Tisserand or the lovely Lindsi Dec. Unlike those two more experienced women, Adomaitis is just learning to tame her arms and legs. Russell periodically would call out to her, "Chelsea, watch your hips," in an effort to get Adomaitis to keep her long torso in line. Sweaty with concentration, the dancer would endeavor to comply. What sets Chelsea Adomaitis apart, both in rehearsal and onstage at McCaw Hall, is the great joy that seems to radiate from her when she's moving. It could be sweat that makes her face shine, but I'm betting that it was equal parts passion that fueled her as one of the gold-clad Fates in Twyla Tharp's recent premier Waiting at the Station. That's her on the right, in the photo below. It's thrilling to watch Adomaitis as she learns to meld her passion with growing technical confidence; she has a full career ahead of her. 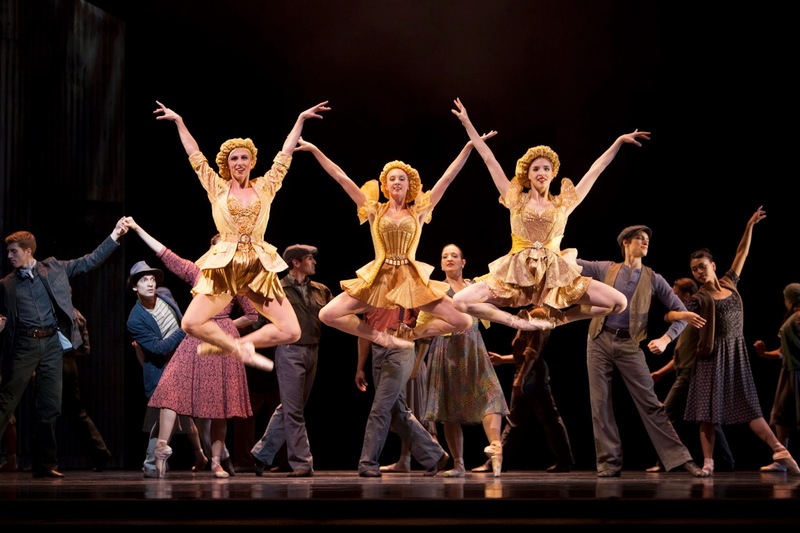 Pacific Northwest Ballet corps de ballet dancers (l-r) Elle Macy, Sarah Pasch, and Chelsea Adomaitis with company dancers in Twyla Tharp’s Waiting at the Station. Photo © Angela Sterling. On the other end of the professional spectrum, and amid a different art form, is long-time Seattle gallery mainstay Francine Seders. She'll close her eponymous Phinney Ridge gallery on Christmas Eve, after almost a half century in business. Like young Chelsea Adomaitis, Seders' passion for her art is visible. She lights up in conversation about the artists she represents, still enthusiastic about the talent she sees. On a recent, sunny afternoon, I stopped by to talk with Seders. Her lovely main gallery space was empty of visitors, though not of art. The walls vibrated with Elizabeth Sandvig's brightly hued geometric paintings, and small pedestals displayed whimiscally delicate sculptures by Marita Dingus. Seders led me through the gallery to her office, where her huge Siamese cat dozed contentedly in a shallow cardboard box. Another of Elizabeth Sandvig's colorful paintings, a sort of landscape, dominated one wall. Seders will be 81 in December, the nominal rationale for her to close her gallery now. She seems bemused by the media attention she's received since the news broke last summer. "Where were you before now?" she wonders, only half joking. Would more media attention have kept her in business longer? Who knows? Seders' art gallery is a second chapter of sorts. She was trained as a lawyer in her native France. When she moved to Seattle, she enrolled in library science classes. But, in need of a job, she answered an ad for a secretary in a local gallery, and thus was born Seders' long-lived career as an art dealer. "I love painting," she told me, and she's represented some of the best in the Northwest, including Sandvig's husband, Michael Spafford, along with the late Jacob Lawrence. In the 1960's, when some galleries were opening in Pioneer Square, Seders resisted, and moved to her present location, an unpretentious house kiddy-corner from Red Mill Burgers on the top of Phinney Ridge. "I didn't like Pioneer Square," she confesses. For more than 45 years, Seders put together shows in this house; her Sunday afternoon openings were lovely affairs. Colleagues like Greg Kucera praise Seders for her generosity and support. But Seders told me members of the Seattle Art Dealers' Association were surprised when she decided to let her membership lapse. It had gotten too expensive, she explained, and it didn't make business sense to her. And an art gallery is a small business like any other commercial venture in our internet era. No matter how much passion you have for your inventory, you still have a bottom line. And you face the squeeze from new online retail outlets. Even after she closes her gallery, Francine Seders plans to represent some of her "older" artists. No doubt a greater percentage of those transactions will happen online. She may not love it, but that's the new world order. And on this sunny late autumn afternoon, Seders seems to have made her peace with it. "I'm starting the next chapter," she announces with a smile. "It will probably be a little shorter than the last one." And she starts to laugh, a bubbly sound that makes the Siamese cat raise his head.